Our Floating Oak Bedside Drawer is the practical and stylish solution when you have limited space for a bedside table or for hallway storage. The Urbansize floating range has a simple clean design for that laid-back scandi vibe as well as having maximum storage and practical value. You can easily fit a lamp, book and cuppa on the top with the addition of a generous size drawer to store away all those messy bits. 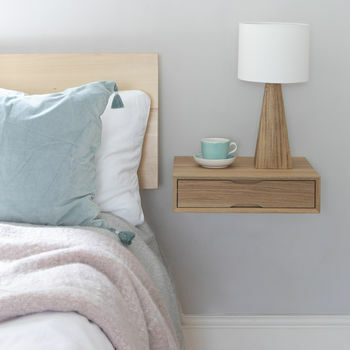 Fitting the bedside to your wall is super simple and wall mounting your bedside means that you leave the underneath free for additional storage and easily accessing under bed drawers. Made from 100% solid oak Dimensions: W40cm x D30cm x H12cm We provide the fittings and full instructions for the (very simple) installation. We provide the fittings and full instructions for the (very simple) installation.